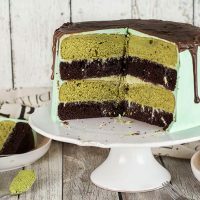 A beautiful Green Tea Cake featuring chocolate matcha cake layers slathered with matcha white chocolate ganache, frosted with vanilla buttercream. and topped with dripping chocolate glaze! Preheat the oven to 350°F (175°C). Grease and flour two 8-inch (20-cm) cake pans. It's not a problem if you only have one. Get it ready. In a bowl, sift together the flour, cocoa, baking powder, baking soda, and salt. Set aside. In the bowl of a mixer, beat the oil and sugar together (for about 2 minutes), until combined. With the mixer running on low, add the eggs, egg yolk, and vanilla extract. Stop the mixer and scrape down the bowl. With the mixer on low, add the flour and cocoa powder mixture in three batches, alternating with the milk. Begin and end with the flour mixture. Stop and scrape down the bowl once again. With the mixer running on low, add the coffee and mix until combined and you get a smooth batter. Divide the batter between two prepared pans, or spoon a half of the batter into the pan, if using one. Bake for 25-27 minutes, or until a toothpick comes out clean. Let cool for 15 minutes before removing from the pan. Grease and flour two 8-inch (20-cm) cake pans. In a bowl, sift together the flour, baking powder, salt, and matcha. Set aside. In the bowl of a mixer, beat the butter for a couple of minutes. Add the sugar and process for 4-5 minutes, until light and fluffy. Stop the mixer and scrape down the bowl. With the mixer on low, add the vanilla and eggs and egg yolks one at a time. Stop and scrape down the bowl. With the mixer running on low, add the flour and matcha mixture in three batches, alternating with the milk. Begin and end with the flour mixture. Mix on medium for no more than 30 seconds. Divide the batter between your prepared pans. Bake for 25 minutes, or until a toothpick comes out clean. Let cool for 15 minutes before removing from the pan. In a heat safe bowl, add the chocolate and sift the matcha over the top. Set aside. In a small saucepan, bring the cream to a simmer. Remove from heat and pour over the chocolate and matcha mixture. Let sit for 30 seconds, then whisk until smooth. Chill until the ganache thickens and has a spreadable consistency. In the bowl of a mixer, combine the egg whites and sugar by hand. Fill a saucepan with a few inches of water and bring to a simmer. Place the mixer bowl on top of the saucepan to create a double boiler. The bottom of the bowl shouldn't touch the water. Stirring intermittently, heat the egg and sugar mixture until it reaches 160°F (70°C) on a thermometer. Return the bowl to the stand mixer. Beat the mixture for 8-10 minutes on high speed, until stiff peaks. Stop the mixer and swap the paddle for the whisk. With the mixer running on low, add the butter, a few tablespoons at a time. Add the vanilla. Turn up the mixer to medium-high and process until smooth. Tint with food coloring, if desired (I used mint green). In a heat safe bowl, add the chocolate and set aside. Bring the heavy cream and corn syrup to a gentle simmer. Remove from heat and pour over the chocolate, whisking until smooth. Add a pinch of salt, if desired. Let cool for about 5 minutes until slightly thickened before using. Level the cake layers once they have completely cooled. Place the first chocolate layer on a cake plate or serving dish and spread 1/3 of the matcha ganache on it. Top with the matcha cake layer and repeat. Frost the sides of the cake with the buttercream. Chill the frosted cake and add the dripping chocolate glaze on top. Enjoy!